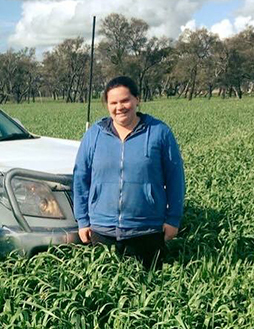 The nomination for the 26-year-old farmhand, CFA volunteer, Victorian Farmers Federation member and mother-of-two commends her work in developing a farm safety mobile phone app – and the timing couldn’t be better. Farmsafe Australia says non-fatal injuries (there were 179 cases last year) cost around $100 million in farm workers compensation. What’s even more heartbreaking is that in 2017, there were 68 farm fatalities – nine involving children under 15 years of age – with quad vehicles, tractors and mobile farm machinery being leading causes of death. Hadzig’s drive to boost safety on farms is a particularly personal one. She grew up on a 1300-acre sheep property around Wallup, about 350 kilometres north-west of Melbourne, and days spent driving tractors, moving sheep, working in the shearing shed and helping her dad with general farm duties developed her deep love of living on the land. Yet when her father was badly injured in a farming accident and his poor health led to the family farm being sold, in a bid to create something positive from the experience, Hadzig began creating a mobile phone application to reduce workplace injuries. Although still in development, when it gets off the ground, the app will be used for farm safety inductions, maintenance alerts and for logging faults and issues around a property. Your reaction when you found out you’d made the cut as a Victorian finalist, chosen from a field of 16 top quality applicants? When I found out, I was so shocked that I was speechless. I really didn’t know how to respond. I didn’t think my idea would make the cut. I am over the moon about becoming a finalist. How did the idea for a mobile phone app come about? I was looking at the WorkSafe website, trying to figure out a way to make it easier to access the information, and it grew from there. The challenge has been trying to include all the relevant occupational health and safety components. When will the app be up and running? I’m talking to some people to possibly join their mobile phone application and put my ideas in with theirs – this could be completed within a few months, if I go this way. As I progress the concept I will be keen to link in with WorkSafe and other regulators in the farm safety space. How could the app potentially help prevent farm injuries? By giving workers a policy about not having children around the working area on a farm, in order to avoid children’s injuries or deaths. By sharing information about requirements when working at heights, in order to reduce the risk of falls. And by giving warnings when working near powerlines with a front-end loader, to help prevent electrocutions. Talk us through the farm safety inductions on the app. They’re for new employees or contractors: they’ll have emergency procedures, child safety checks and inductions information for machinery. And the maintenance requirements alerts? These are for when you have multiple farm workers and a change-over shift, for example. They’ll make people aware of what maintenance has been done and what maintenance still needs to be done. Where does the ‘logging of faults’ function come in handy? It ensures absolutely everyone on the farm is on board with what’s wrong: it acts as an extra precaution. How do you encourage the next generation, particularly women, to consider careers in agriculture? By speaking at school career days, conferences and at agriculture colleges: it’s my way of giving back to those who have passed the knowledge to me. You were dux of your Certificate IV in Agriculture course at Longerenong College, 20 kilometres north east of Horsham, and you completed your traineeship through A.V. Jochinke and Co. Now you’re working at Western Ag Supplies and as a casual farmhand on a farm in Murra Warra. What does your typical day look like? It involves selling chemicals, general merchandise and animal health products. I have the chance to get to know the clients and their enterprises, and I can be there to listen when they might be going through a tough time. I plan to continue working full-time in the agriculture industry as that’s where my passion is. I’ll continue to look at opportunities to challenge myself – I’ll take every opportunity that presents itself as it’s ALL experience and will help me in the future. Do you dream of having your own farm one day? Yes, I’d love to be based in the Murra Warra/Wallup area in the Wimmera, close to where I grew up. Find out more about the AgriFutures™ Rural Women’s Award. In addition to the Victorian AgriFutures™ Rural Women’s Award, the Victorian Government also supports other initiatives that empower and support rural and regional women. The Rural Women’s Network is supporting rural women to have a more active voice in government and community decision-making. Also, The Invisible Farmer project offers Victorian women in agriculture the chance to share their inspirational stories.